Work, Social Inequality, Gender, Economy, Culture. Culture and markets; inequality; gender; consumption; service work; China. Consumption and inequality in China, culture and social change in Chinese marketplaces. 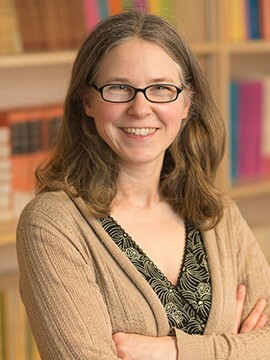 My research centers on topics such as work, gender, and the cultural aspects of markets, and most of my research has focused on contemporary China. Past research includes a study of service work and class inequality in urban China, published by Stanford University Press as Service Encounters: Class, Gender and the Market for Social Distinction in Urban China (2008). More recent projects examine Chinese consumer goods in North America and food safety and imported milk in China. In a current research project, funded by a SSHRC research grant, I am looking comparatively at the regulation of street commerce in China and North America, and in particular at the way Chinese cities manage and in many cases are attempting to eliminate street vending, whereas (some) North American cities are embracing “street food” and food carts as emblems of cosmopolitan urbanity. Hanser, Amy. 2008. 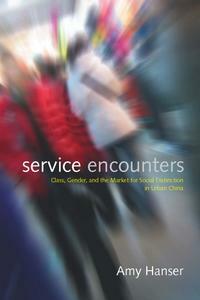 Service Encounters: Class, Gender, and the Market for Social Distinction in Urban China. Stanford University Press. This lively study explores how social and economic changes to Chinese society create new cultural values and forms of inequality. Amy Hanser examines changes to a particular set of jobs—service work, in this case salesclerk work—and the nature of the social interactions involved. It argues that a new "structure of entitlement," which makes elite groups feel more entitled to public forms of respect and social esteem, is constructed in settings like new, luxury department stores. The book not only shows how this change involves increasingly unequal relations between clerks and customers, but also demonstrates how marketplaces have become sites where social differences—and inequalities—are recognized and justified. The study's importance lies in its attention to ethnographic detail, its application of cultural theories of inequality to China, and its contribution to our understanding of contemporary China. Unlike other studies of inequality in urban China, this book takes a unique setting—the marketplace and the interactions between customers and salespeople—and a unique approach—the author herself worked as a salesclerk in three settings. Hanser, Amy. 2016. “Street Politics: Street Vendors and Urban Governance in China.” The China Quarterly, 226:363-382. Hanser, Amy and Jialin Camille Li. 2015. “Opting Out? Gated Consumption, Infant Formula and China's Affluent Urban Consumers.” The China Journal, 74:110-128. Hanser, Amy and Zachary Hyde. 2014. “Foodies Remaking Cities.” Contexts, 13(3):44-49. Hanser, Amy. 2012. “Class and theService Encounter: New Approaches to Inequality in the Service Workplace.” Sociological Compass, 6(4):293-305. Hanser, Amy. 2010. “Uncertainty and the Problem of Value: Consumers, Culture and Inequality in Urban China” Journal of Consumer Culture 10(3):307-332. Hanser, Amy. 2009. "Yellow Peril Consumers: China, North America and an Era of Global Trade," in K. Merkel-Hess, K. Pomeranz, and J. Wasserstrom, eds, China in 2008: A Year of Great Significance. Rowman & Littlefield. Hanser, Amy. 2007. "Is the Customer Always Right? Class, Service and the Production of Distinction in Chinese Department Stores." Theory & Society, 36(5):415-35. Hanser, Amy. 2006. "Sales Floor Trajectories: Distinction and Service in Postsocialist China," Ethnography, 7(4):461-491. Hanser, Amy. 2006. "Serving the State, Serving the People," in J. Eyferth, ed., How China Works. London: Routledge. Hanser, Amy. 2006. "A Tale of Two Sales Floors: Changing Service Work Regimes in China," in C. K. Lee, ed., Working In China: Ethnographies of Labor and Workplace Transformation. London: Routledge. Hanser, Amy. 2005. "The Gendered Rice Bowl: The Sexual Politics of Service Work in Urban China," Gender & Society, 19(5):581-600. Hanser, Amy. 2004. "Made in the P.R.C. : Consumers in China," Contexts, 3(1): pp.13-19. “Vancouver: Street Food and Urban Space,” paper presented at Histories of Capitalism, Social Science History Association 37th Annual Meeting, Vancouver, BC, Nov. 1, 2012. “Eventful Consumption: Consumers, Crisis and the Foreign-Domestic Divide,” paper presented at the Annual Meeting of the American Sociological Association, Denver, CO, USA, August 19, 2012. “Yellow Peril Consumerism: China, North America, and an Era of Global Trade,” paper presented at the International Sociological Association World Congress, Gothenburg, Sweden, July 15, 2010.